This entry was posted in Racing on February 17, 2011 by Steve Tilford. I grabbed this off the USA Today online this morning. 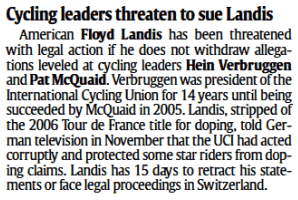 I saw in Cyclingnews, a few days ago, that the UCI was threatening to sue Floyd, but didn’t really pay much attention to it. But, here is an article in USA Today about it. They gave about the same amount of space to this as to Lance retiring yesterday. Here is the article from Cyclingnews. The link at the bottom of the article is interesting. It just goes to another article that shows that the UCI can be subjective in their punishment. I am pretty positive that most people agree that doping infractions should not be subjective. I’d like to see this lawsuit filed. It’s too bad that it sounds like it would be in Switzerland. I would be better for Floyd if it were to be held in the US. Better and worse I guess. I doubt Floyd would defend himself in Switzerland. It would just be another one of those countries that he can’t go to. But, if it were to be held in the US, that would be interesting. Interesting enough that if Floyd did a public outcry for help for his legal defense, again, I’d consider giving. I’d like to see all the evidence thrown out there in a court of law. I doubt we’ll see much of this federal investigation go public. I’d bet it just gets buried or settled somehow. Do you think Floyd should repay something back for his years of lying and withholding evidence? Funny – Pat McQuaid, the president of the UCI, has admitted that it was a mistake in hindsight for the UCI to accept a $100,000 donation from Lance Armstrong eight years ago – I don’t see that Floyd Landis statement to be too far off base PLUS does the UCI want to get counter-sued for limiting Floyd Landis freedom of speech and opinion as a former pro cyclist? I have several friends in Zurich that could help Floyd defend the lawsuit – but all I see is a scare tactic on the part of the UCI – which in reality should not be playing this out in the media. “In 2005, Armstrong confirmed he made a donation of “six figures” to the UCI several years prior, purportedly “to help fight doping.” In keeping with his desire to “work quietly behind the scenes,” Armstrong wanted the gift kept secret. What is most significant about the matter is that he made the donation while still an active athlete and subject to the UCI’s discipline. Of equal significance is the fact that the UCI accepted his “gift”. 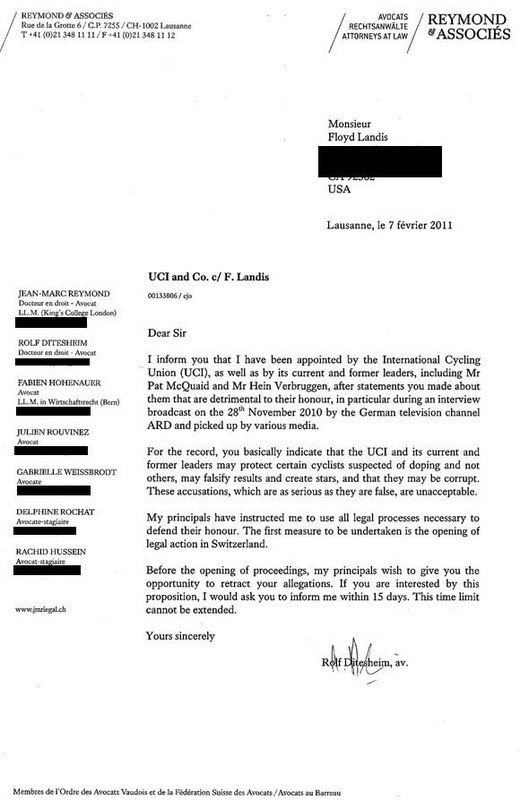 I came across this letter from UCI attorney to Floyd on another blog. So Floyd should be able to make accusations without proof? In the U.S. that’s called slander. Even if the UCI is corrupt and has protected certain riders, if Floyd can’t prove it, he shouldn’t be saying it. You don’t need direct evidence to prove a crime has been committed, circumstantial evidence will do just fine, and it looks like there’s sufficient circumstantial evidence to justify at least an investigation, if not arrests and prosecution. Covering up, and shutting up, just perpetuates the problem. Right now, cycling is quickly losing its credibility, and it needs to be cleaned up, and the way to do this is to get the full extent of the problem out into the open, and then take the appropriate measures to make sure the bad guys get kicked out for good, and then keep the sport clean from then on out. Pingback: UCI & Floyd Suit?